Nature Seychelles the national NGO that runs the Reserve will reveal this status at the opening ceremony of the 2010 Tourism Expo to celebrate Tourism and Biodiversity during World Tourism Day and week to be held on Monday 27 September 2010 at the ICCS, Victoria. In attendance will be Mr. Matthew Forbes the British High Commissioner to the Seychelles, the Chief Executive Officer of the Seychelles Tourism Board Mr. Alain St. Ange, who will be opening the Expo, and other invited guests. The British High Commission in Seychelles funded the assessment. The Special Reserve welcomes thousands of eco-tourists each year. In recognition of the environmental impact of these visitors to Cousin, most of whom fly from Europe and reach the island by boat, and after media reports in Europe urging citizens not to travel to long haul destinations like Seychelles, Nature Seychelles took the decision to make the Reserve carbon neutral. “We initiated a process that involved measuring all the emissions associated with the island, reviewing opportunities for on-going reductions and investing in carbon credits from a clean cook stove project in Sudan.” Kerstin Henri, Nature Seychelles’ Director for Strategic Operations says. Carbon Clear - a leading carbon management company - measured the Reserve's carbon footprint by looking at various activities associated with visitors arrival to Cousin and its operations. The calculations of the footprint however also recognized the contribution of the reforestation programme on the island. “We did not want to purchase credits over the internet or invest in just any generic scheme. The process we initiated lasted about 15 months but provided a verifiable and assured result.” Nirmal Shah, says. And although this activity was voluntary, an assurance was undertaken with Nexia, Smith and Williamson, a European assurance and audit firm, to certify that both the measurement and offsetting process had been conducted to the highest standards. 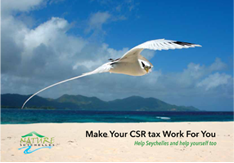 Nature Seychelles is a multiple award winning non-profit environmental organization in the Seychelles involved in a wide range of exciting activities to improve environmental standards. Conservation activities on the Reserve include monitoring of the island’s biodiversity, research, re-introduction of endangered species such as the Seychelles Magpie robin, ecotourism and education. 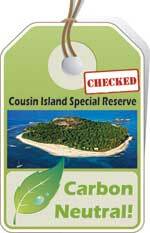 Cousin has received international awards for its conservation and ecotourism efforts.